Immunoprecipitation of PRAS40 from untreated HeLa cell extracts. Lane 1 is 10% input, lane 2 is Rabbit (DA1E) mAb IgG XP® Isotype Control #3900, and lane 3 is PRAS40 (D23C7) Rabbit mAb #2691. All lanes are probed with PRAS40 (D23C7) Rabbit mAb as the primary antibody. Secondary antibodies include Mouse Anti-rabbit IgG (Light-Chain Specific) (D4W3E) mAb (left panel) and Anti-rabbit IgG, HRP-linked Antibody #7074 (right panel). For the left panel, the bound Mouse Anti-rabbit IgG (Light-Chain Specific) (D4W3E) mAb was detected by Anti-mouse IgG, HRP-linked Antibody #7076. The positions of the reduced and denatured rabbit IgG heavy and light chains are indicated. Mouse Anti-rabbit IgG (Light-Chain Specific) (D4W3E) mAb recognizes the light chain of rabbit IgG, either in its native conformation or in its denatured and reduced form. It does not bind to the denatured and reduced rabbit IgG heavy chain (about 50 kDa) on western blot. Mouse Anti-rabbit IgG (Light-Chain Specific) (D4W3E) mAb only reacts with the light chain of rabbit IgG and does not bind to the denatured and reduced rabbit IgG heavy chain. 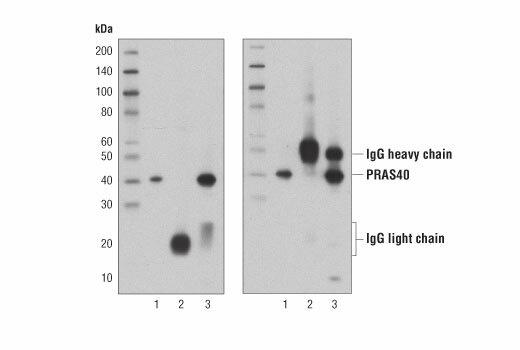 When performing immunoprecipitation (IP) followed by western blotting, the denatured rabbit IgG heavy chain of the primary antibody used for IP runs at approximately 50 kDa on the subsequent western blot and can often obscure bands of proteins that have a similar molecular weight. Using Mouse Anti-rabbit IgG (Light-Chain Specific) (D4W3E) mAb as a secondary antibody will eliminate this problem.